If you listened to our Salute 2017: Interviews podcast, near the end you would have heard us chat to James Baldwin about The Drowned Earth Miniatures Game, which is currently being funded on Kickstarter. Some people may roll their eyes as we see ‘yet another warband skirmish game on a 3′ x 3′ table’ – however, James and his team are looking to do something a bit different with their miniatures and setting – I don’t think we’ve seen anything quite like this before, which is a very good thing in my opinion. The setting is most definitely science fiction – set in the land of Ulaya, a tropical world of flooded cities and ancient ruins. Simply looking at the factions shows us not just humans, but ape and reptilian characters and I find it refreshing that the races are mixed in the different factions, rather than being divided by species as they are in so many other games of this nature. The models are very good indeed – I managed to see them in the flesh at Salute and they live up to the pictures that are shown on the Kickstarter page. They are produced in metal, but are somewhat on the large size, being almost 35mm in scale. The project is raising funds to produce the models and rules, and includes pledge levels for purchasing multiple factions, should you so wish. At time of writing the project has smashed it’s £5,000 target several times over. It’s running until the 16th May, with delivery scheduled for April 2018. 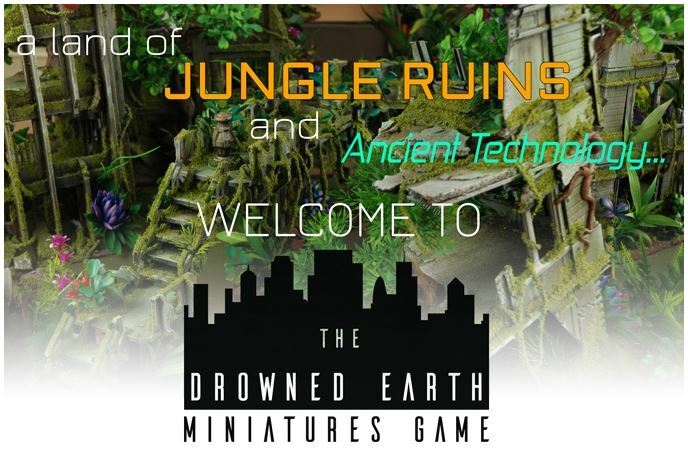 You can find out more details by visiting The Drowned Earth Miniatures Game Kickstarter page.